Togidashi Nashiji Urushi for finishing layer. Color is shinning transparent, it is reddish color than Jyoushuai Urushi, this is for mid-layer use after gold and silver powder pattern layer. 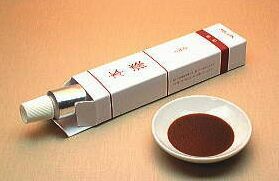 When used with gold powder, called Kin-Nashiji; used with silver powder, called Gin-Nashiji.